Cheryl Petty left for China to work as English editor at Tsinghua University. As a freelance writer and video artist, she wanted to dive into the fascinating and rapidly changing culture of this immense country. Bonsai was one of the treasures she wanted to explore and to see if things have changed in this traditional old art. She took a trip to the Shanghai Botanic Garden and met the director Mr. Hu Yun Hua. Photography by Cheryl Petty and the Shanghai Botanic Garden. The famous and largest botanical garden in China, is situated in southwest Shanghai, China’s biggest city, a booming centre of trade, finance, fashion—and bonsai, of course. There is a metro nearby, so travel to the garden is convenient. Sited alongside a canal, it covers about 2 kilometres by a half kilometer and is noted for its medicinal, orchid and bonsai gardens. In its 200 acres, there is a large greenhouse with a wide variety of plants. In the bonsai garden, or the penjing Yuan, you can walk around in a garden type setting, viewing rows and clusters of various trees. A fine drizzle greeted me on the day I visited A fine drizzle greeted me the day I visited Shanghai Botanical Gardens (SHBG) in March of 2011. I had flown down to Shanghai from Beijing for the weekend, hoping to sightsee and do some shopping for which Shanghai is famous, couple that with a visit to see the acclaimed Penjing collection and interview the director Mr HU Yun Hua. Serena SHAN from the gardens staff escorted me via park tram to the offices of the collection where we were joined by Bridget WONG and ZHAO Wei. All these young people have degrees in horticulture. Bridget has a Master’s Degree in Landscape. ZHAO, Vice Manager Penjing Garden, has a Master’s in Penjing and is responsible for the daily care of the trees as well as creating new ones. We toured the small museum with choice examples of Chinese stands, benches, pots and accessories before going to lunch at the exquisite restaurant on the gardens campus with private dining rooms as well as a large open dining area. Robert ZHEN, man of WBFF Office, joined us and was going to be our official translator for the interview with Mr HU. In a comfortable lounge with contemporary overstuffed chairs and cups of hot water, I was able to meet Mr HU for the first time and review some of the questions we would be asking in the video. HU explained that Penjing is an ancient art form specific to China which has evolved and spread throughout the world as Bonsai. It refers to a tree in a pot, an art of creative training and cutting, imitating a miniature landscape, adding rocks or sculpture to build a scene like a painting or poem or the posture of an aged tree. The challenge to modern Chinese Penjing artists, he says, is that "Chinese Penjing needs better exposure to the West." From the 1970s to now, and especially in the past three years, Penjing has seen rapid progress thanks to the support of new wealthy Chinese businessmen. HU estimates that there are more than ten million Penjing hobbyists in China; many belong to clubs in their regions. "People outside China know little about Chinese Penjing. Now we want to promote and introduce Chinese Penjing with its long history, and share our great art of Penjing with enthusiasts from around the world." Born in 1943 and graduating from Beijing Forestry University in 1964 with a degree in Chinese Horticulture, Mr HU began his career designing big gardens in Shanghai, China, pointing out the connection between landscaping small gardens and Penjing as little landscape gardens. He says humorously, "Being a successful Penjing designer is more convenient and easier on the back than being a big landscape designer." In the 1970's Mr HU honed his skills at the Shanghai Penjing Studio, a research and conservation center for Penjing. Penjing, an ancient traditional Chinese art, can trace its origins back 1,900 years to the Han Dynasties. It has been found depicted in early Chinese wall murals dating from the Tang Dynasty, about 706CE. These paintings were discovered in 1972 at the tomb of Prince Zhang Huai at the Qianling Mausoleum site in Shaanxi province. A guild of tree masters near Suzhou in the province of Jiangsu is known to have produced miniature trees since 1276CE. The word 'Penjing' can trace its origin back 300 years to manuscripts from the Qing Dynasty. Compare this to the earliest known depiction of tray landscape in Japan dating from 1309CE. It is easy to spot the word development of Chinese penzai to Japanese Bonsai and Chinese Penjing to Japanese bunjin. During the Heian period in Japan (794-1191CE), Chinese introduced the art of making miniature plant landscapes to Japanese Buddhist monks along with tea and other cultural gifts. The style of penjing that was carried across the sea was the literati style. The Tang Dynasty period 618-907CE was a glorious and prosperous time for the arts. At that time Penjing became popular and had close connections with painting, poetry and calligraphy. The Literati style Xu Hue Xe was modeled after the character and philosophy of calligraphy. This original style represents a state of mind rather than a particular tree style. This aesthetic was influenced by the political and academic conditions of the time when Penjing was widely practiced by the elite and characterized by the qualities of aloof, sparse, refinement, elegance and plain. It was at this time that the great culture transfer from China to Japan began. The style of Penjing that was carried across the sea was the Literati style popularized by the Monk Suren at the Haichuang Monestary in Guandong (Canton) province and called Wenren Mu. This style is characterized by a willowy or sparse, thin trunk with bunches of foliage at the top and ends of branches in a small bowl. The SHBG Penjing collection is the largest and most renowned in the world, with over two thousand potted trees of two hundred varieties, and with many more thousands in nursery training. It comprises approximately four hectares or 40,000 square metres and receives 200,000 visitors a year, all being maintained exquisitely by 20 full time staff. Originally called Longhua Nursery when founded in 1974, Mr HU Yun Hua started working there in 1975 and was quickly promoted in 1977 to Post Director, Curator of Penjing. At that time there were more than 2,000 trees in the collection from all over China and also some masterpieces donated from Japan. In 1978 its name was changed to Shanghai Botanical Gardens. In 1988, Mr. Hu began a worldwide tour, including a number of demonstrations in Mineapolis MN, Atlanta GA, Philadelphia PA, ? City name NJ and Chicago IL. He also visited many countries including Australia, New Zealand and Europe for Penjing demonstrations and lectures. This was a great honor, and he was able to promote Penjing with greater resources as gardens director. Personally, though, he had less time to create, yet Penjing was the true love he never forgot. 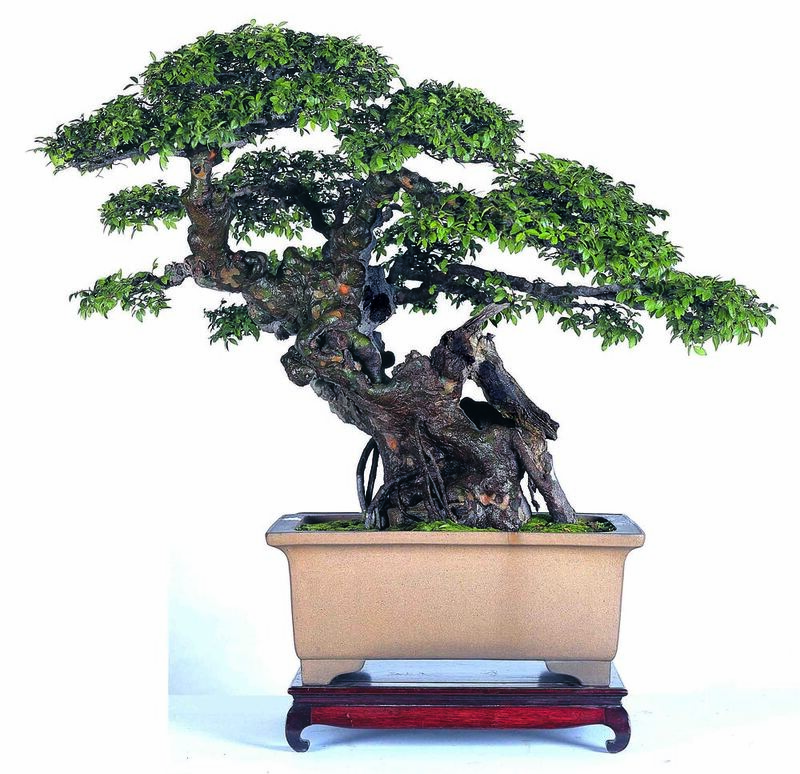 In 2013 the Bonsai Clubs International and the World Bonsai Friendship Federation, the two largest international Penjing organizations, will hold a joint Penjing convention in Jin Tan City, Jiang Su Province, PRC. Not only is Mr HU the Director of SHBG, but he also is the 2010-2013 Chairman of the WBFF. They welcome and invite all the Penjing enthusiasts in the world to come to China to visit. Mr HU adds, "China has made great progress to opening to the world since the 1970s. People's living standards have also improved. There are many large private gardens now which include Penjing collections. We want to communicate with the global community of Penjing lovers. Thank you, Xiexie!" Guangzhou Liuhua Western Garden and Shenzhen Qu Yi Garden in Guandong Province featuring Penjing was founded March 2010. Located in Liuhua Lake Park in Guandong, it is a special research and promotion site for Lingnan School of Pinjing. Shenzhen Qu Yi Garden was founded by Mr WU Cheng Fa, WBFF International consultant and Vice Chairman of HongKong Penjing and Artstone Society. The collection has more than 2,000 Penjing, ancient pots and art stones. There are notable Penjing collections at the Beijing Botanical Gardenat the foot of the Western Hill in Haidian District, Beijing, PRC and in the National Bonsai and Penjing Collection of Australia in Commonwealth Park in Canberra, Australia.